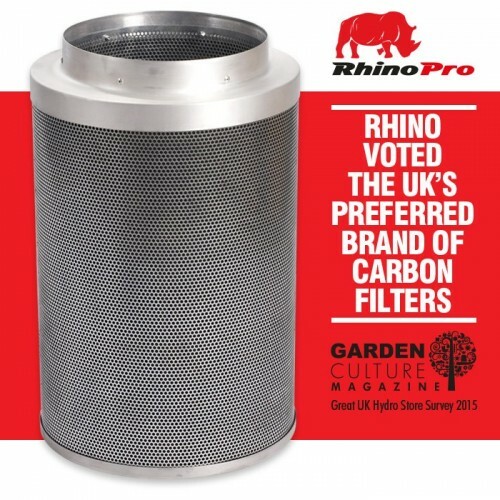 Rhino Pro Carbon Filters are high quality carbon filters designed to filter the air in both indoor and outdoor growing environments. Constructed from RC412 carbon mined in Australia, these filters are designed for superior transference. They are designed from lightweight aluminum and high porosity carbon so they are smaller than the average filter thus they are easier to manage. Rhino Pro Carbon filters will draw out stale air. Once they are attached to a Sileo RVK extractor fan according to proper duct size and airflow requirements, they will draw air to the outside of the fan and then filter out dust and debris from clogging the main filter. The air will then be filtered to the main filter which contains the worlds best carbon, RC412 to eliminate unhealthy particles and odors. 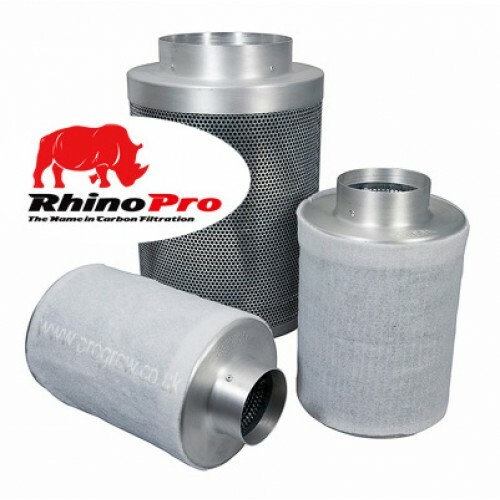 One of the primary advantages of Rhino Pro Carbon Filters is that unlike their competitors, they are designed to last over two years. If you consistently replace the carbon sleeves, you can lengthen the systems lifespan significantly. Directions for use: This amazing filter system must be securely and properly attached to work effectively. Make sure the measurements are correct and that you follow the directions on the packaging for your specific filter system. Remember to attach the Rhino Pro Carbon Filter to the intake section of your fan, not the outlet side. This ensures that the air is sucked into the system rather than blown out of the filter. Also make sure that you install the system as close to your growing environment as possible without covering or obstructing the filter system. Also make sure that is is properly secured with a duct clip or fast clamp. It is also imperative to control the humidity in your growing space as excessive humidity can render the system ineffective. 2 Plies of tough aluminium foil / polyester laminate Reduced Noise Reduced Heat Laminated with flame..
Systemair RVK Sileo FansThe Systemair RVK Sileo Fan series is an in-duct fan system for the removal ..
ISO Max Extractor Fan Iso-Max Fans utilise the low energy and high performance motor of the Ruc.. Carbon Filter Fast ClampA Fast Clamp is a wide metal collar, lined with dense foam, which can be tig..
Tornado Fans range from 1000 M3 to 4250 M3. These box fans are a must have for large scale growing o..
Rhino Pro Carbon filters will draw out stale air. Once they are attached to a Sileo RVK extract..
•	Scientifically developed to be effective during the blooming and fruiting stages•	Works great with..
WHAT'S INCLUDED1 x Matrix 1.2 x 1.2 x 2.0m Grow Tent 1 x Lumii Black 600w Grow Light Kit1 x Pow..
Buddhas Tree Solar Green Power Buddhas Tree Solar Green Power uses silicic acid – the most avai..